Don’t miss this pretty in pink for a cause event that annually brings out the best of the best of our city’s female news anchors and elite journalists. 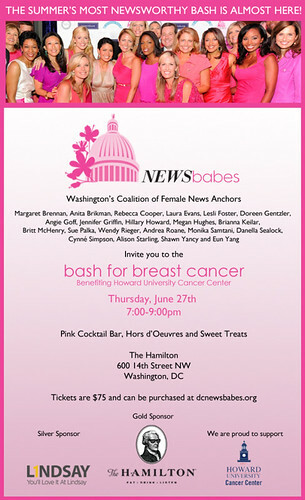 NewsBabes Bash benefits Howard University Cancer Center and will be held at The Hamilton, literally one of the coolest venues in town. Guests can purchase tickets for $75 and can expect a pink cocktail bar, hors doeuvres and sweet treats. Bring your colleagues, beaus, foes, family and friends and be sure to wear a bit (or a lot) o’pink.